Indiana’s musical son John Mellencamp played two sold-out shows on Friday & Saturday night in Clearwater. The Midwest native brought the hits and then some. Starting off the show with a 24-minute film excerpt about his life and career from his 2017 full-length film “Plain Spoken”.You can catch the entire film on Netflix. It is a well-done film, part documentary, part live music with John narrating and telling the stories of his life. Mellencamp came to the stage with “Lawless Times”, a song about the current state of life in the U.S. from streaming music to the Catholic church. John has always been regarded as a musical spokesman for the Midwest, but the reason his music resonates across the nation is that he writes about the human condition in America. His experience in the music business from being named “John Cougar” to sell records to fighting his way to being the real Mellencamp has given him a unique view. He is the quintessential rebel who does it his way whether writing music or painting artwork which is now being shown in museums. John Mellencamp played at Ruth Eckerd Hall in Clearwater, FLAnother thought-provoking tune was “Easy Target”, from his critically acclaimed album “Sad Clowns and Cowboys”. Lyrics telling the real-time story about all of us being easy targets of the random shooter to the struggle of Black Lives Matter. 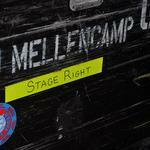 Mellencamp has never minced his words and sings for the downtrodden. He makes a huge statement at the end of the emotional song by taking a knee! The audience was extremely quiet with the exception of a few people clapping. John Mellencamp brought his great band with him to Ruth Eckerd Hall in Clearwater, FLMid-show John does a tribute to his grandmother, who always called him “Buddy”, with a story of a spiritual experience he had with her. Touching and humorous it takes him into his tune about life with “Longest Days” from his 2008 album Life, Death, Love, Freedom. The second half of the show starts a laundry list of hits with “Crumblin’ Down” and the audience is up on their feet for the majority of the rest of the show. The band leaves the stage with John alone on acoustic guitar for a sing-along of one of his biggest hits, “Jack & Diane”, where the audience is really doing most of the singing, knowing every word and every clap! It is a fun, youthful moment for the mostly boomer audience, including Mellencamp with a smile on his face. John’s band is one of the best in the business. Guitarist Mike Wanchic has been around since the beginning. John tells a hilarious story about the band coming here in the 70’s and Mike getting arrested with John going to the jail to bail him out. Andy York on guitar and drummer Dane Clark have been in the band since the 90’s. John Gunnell is on bass and Troye Kinnett on keyboard and accordion. Kinnett and the amazing violinist Miriam Sturm perform a duet of accordion and violin that includes a nod to John’s first hit “I Need a Lover”. John Mellencamp plays his guitar at Ruth Eckerd Hall in Clearwater, FL“Authority Song” has the audience singing with fists in the air in agreement “Authority always wins!” “Pink Houses” is the anthem for middle America. Of course, John’s line of “Working in some high rise and vacation down at the Gulf of Mexico” was not lost on the Tampa Bay audience who were yelling and howling at the line. The #1 hit “Cherry Bomb”, a tribute to the 60’s nightclub scene, closed the show. John is one of our most prolific songwriters writing about life during this era in the U.S.A. He has come a long way from the days of “John Cougar”, but we are glad he will still sing the songs about them.